Junior Assistant, Senior Assistant, Librarian and Physical Director. Total 1113 posts in this TSPSC Junior Colleges Recruitment 2017. TSPSC will release notification first week or December 2017 probably. Candidates who are interested in this Junior College Jr Lecturers and Junior/Senior Assistant and other jobs may start preparation now itself. Online applications will be accepted for this TSPSC Junior Colleges Junior Lecturers Jobs. Candidate will be selected through written test for this TSPSC Junior Colleges vacancies recruitment 2018. 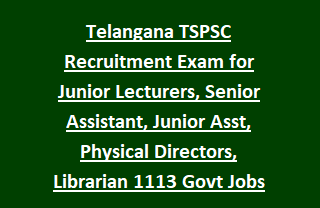 More information about this TSPSC Govt Junior Colleges vacancies of Librarian, Physical director, Senior Assistant, Junior Assistant and Junior Lecturer jobs vacancies are given below. There are total 1113 vacancies in this TSPSC Junior Colleges Recruitment 2018. For other posts refer official website of tspsc.gov.in. Candidate will be selected through Preliminary Exam and Mains Examination. Submit application form online or this TSPSC junior Colleges recruitment through official website of http://tspsc.gov.in.